The February CIPA report has been published, and overall, it's still not a pretty picture for the digital camera industry. According to the Japanese agency, overall digital stills camera shipments worldwide were down 26.6% compared to the same month last year. The CIPA report shows overall digital camera shipments remained flat—a 27% decrease compared to the same month last year. That's the bad news. The good news is that most of that drop is due (once again) to the demise of the compact camera. If you break Interchangeable Lens Cameras (ILCs) out of that picture and into its own graph, the story gets a bit rosier. 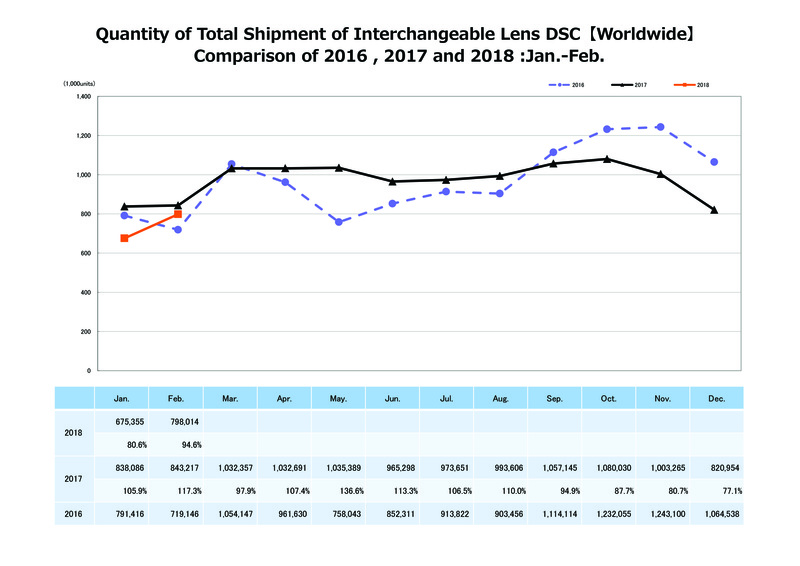 ILC shipments (that's DSLR and Mirrorless combined) were down only 5.4% compared to the same month last year—DSLR sales by themselves actually eked up 0.1%, while mirrorless sales dropped by 15.8%—and outperformed February 2016 by 17.3%. 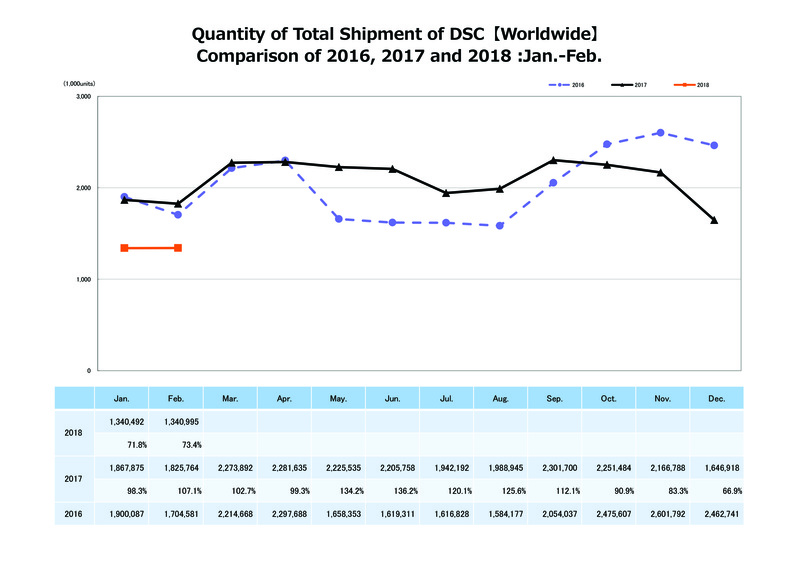 ILC shipments actually outperformed 2016, coming up only a few percent short of last year's February report. This month's shipment numbers compared to the same figures from last month. From top to bottom: All Digital Cameras, Compacts only, all ILCs, DSLRs only, Mirrorless only. Taken as a whole, a weak end to 2017 seems to have led into a weak beginning to 2018. But if you look at ILC numbers by themselves, the picture is a bit less bleak. Sure, 2017 still ended on a pretty sad slump compared to 2016, but February has seen a big jump over January where, in previous years, that line has stayed flat or even seen a decline. If March outperforms February—as is usually the case—it could mean the ILC market, least, is stabilizing a bit. And if Canon and Nikon release full-frame mirrorless cameras sometime this year, we could even see 2018 outperform 2017. Of course, that's all speculation for now, but we'll be keeping a close eye on the numbers in the coming months. In the meantime, if you want to dive deeper into shipment data by region, or see how camera production did in February (DSLRs up 4%, Mirrorless down 11%), head over to the CIPA website. Former compact camera users stick with their phone cameras. Why should they/we add a pretty cheap compact camera to our excellent mobile phone cameras, where images immediately can be put on social medias? Exactly, i can count at least a dozen examples from my close friends and family who used to have compacts (the casual user type, who bought 1 mid-price compact camera every 3-4 years) that now rely only on their smart-phone. And no they have absolutely zero interest into moving to something "more advanced". @Tomjar - that chicken or egg problems been solved. The egg came first. Dinosaurs were laying eggs way before their were any chickens about! Partly it's the manufacturers going more up-market to keep margins high and differentiate themselves further from phones. High-cost compacts will naturally have much lower sales. Agreed. This is from a guy that still carries a Coolpix A around everyday. High-end compacts wipe the floor with the phone images they are supposedly competing with, and many photographers would love a high quality, compact camera a-la the X100 series. Look how popular high-end film compacts have become over the past few years. But why haven’t the manufacturers really introduced anything in the category in the past 4-5 years? @badi: "Exactly, i can count at least a dozen examples from my close friends and family who used to have compacts (the casual user type, who bought 1 mid-price compact camera every 3-4 years) that now rely only on their smart-phone. And no they have absolutely zero interest into moving to something "more advanced"
I totally understand the free-fall decline of low-end (even mid-level) compacts for casual users, but what about the advanced high-end compacts for advanced users? Phones are absolutely no match for such cameras in terms of functionality, versatility, capabilities - except the IQ maybe. But still, these compacts are gone too (almost). Well i guess sales numbers prove what's going on. ML are on a downward trend and will soon be extinct. Can't argue with CIPA numbers afterall. Right? A little misleading numbers just by themselves, since DSLR's seem to be caught in a race to the bottom. Flat unit sales, but only because they keep lowering prices (-6%) while mirrorless cameras are still moving up to higher value models. Less unit sales indeed but more than offset by the higher price of the higher value models (+14% overall sales). Neither is ideal by itself (you want keep your ground in the market of the lower cost models too, since it allows for a larger potential user base, many of which may at one point move up or add higher value models to their camera collection), but the race to the bottom will sooner or later eat away margins, followed by R&D budgets, market reputation and eventually lead to a downwards spiral. Many once large companies have faced the same battle (including Sony in other markets). Mirrorless manufacturers have neglected the low-end models and only introduced expensive high-end models. Numbers go down. DSLR manufacturers have continued to release low-end models (where they make most of their sales) and numbers are constant. No, that doesn't explain the continual downwards trend in average DSLR price, the race to the bottom. And looking at more than just 1 month, the tables on unit sales turn as well. The numbers say that the amount of DSLRs sold dropped more significantly than the revenue. That means DSLR go for higher end / more expensive cameras as well. Obviously not as much as the mirrorless cameras. I think the elevated number for DSLR this month is almost entirely due to initial shipments of the super-low-end EOS 2000D and 4000D, the only new DSLR models to start shipping in February. I base this hypothesis on combination of three facts: 1) the only region where DSLR shipment tanked was Japan; 2) the only region where DSLR revenue per unit went UP was also Japan; and 3) the one region where Canon traditionally doesn't even try to sell the xx00D segment is also Japan (SL2 is marketed as the entry level body instead). Now look at the the market statistics: it look exactly as it would if Canon dumped truckloads of the inexpensive models on the global marketplace, carefully avoiding Japan. I suspect it's much more that shipments per month vary a lot based on special offers and how many were shipped in advance of offers/events. E.g. if you shipped a lot of cameras pre-Christmas and didn't sell them all you won't ship many in Jan. If you have special offers that ended in Jan you will sell less in Feb, etc. TSYYeung: Keep in mind these are cameras *shipped*, not *sold*. They could spend a year on the shelves gathering dust for all we know. Kharan, I don't believe Canon will make cameras to make up numbers. Would have lost so much money don't that, and for no purpose really. @Kharan, you assume Canon has enough power to force its retailers to swallow units that they know they cannot sell. This may have been true once upon a time, but I have my doubts that such a thing is possible today--especially in the US, where powerful retailers like Wal-Mart and Amazon dominate the market, who in turn have to deal with the risk of merchandise returns. Well, for one thing neither of the newly-announced models is targeted to the US market (they haven’t even gotten model numbers there), and when Canon is the only camera brand available to sell, well, they get a lot of leverage over retailers. Remember that Canon have been killing Nikon in sales mostly because of marketing and sales channels (because Nikon have retreated from most mass retailers). All the technology in the world ain't going to replace the experience of composing through an optical viewfinder. Beg to differ. I've used an EVF for a couple of years now and can't think of one reason why I'd want to go back. I never used DOF preview with mirrors, it was too damn dark to see anything, now it's clear as day. I now have focus peaking, blinkies, and the histogram right there in the VF. Most of all, if I've accidentally left the exposure adjustment too high or too low, I can see something is wrong straight away while composing. The information options available in an EVF are staggering. depends with what EVF you compare... yes, older EVFs were rather poor - adding delay between real life and the viewed image was the most important drawback in my opinion. Also, when criticizing the EVFs based on entry level models, also consider that the OVFs of entry level DSLRs are not such a huge joy to use anyway. Exactly ...the OVFs in DSLRs are so poor. Using an old Pentax LX the other day ...the difference is night and day! I use DSLR`s from 10 years and still using Nikon gear for my wildlife shots. Last month i buy old Sony A7 for MF lenses and portrait work for fun. They deal with delays, refreshing rate in cameras as Fujies and Sony a9. Processing becomes faster and faster and soon/or already EVF`s are "fast" as OVF`s. For me the most obvious advantage is that you see what you get and even do not need to preview the shot. And don't forget the number one reason EVF is superior ... it's just like having a teeny weeny cheap colour TV jammed up against your eye. That's how I like to see the world! I find EVFs very tiring to look at for long periods (e.g. waiting for a bird to exit its nest), as they are just little TVs and you have a choice of low dynamic range (LCD EVFs) or poor Colour accuracy (OLED EVFs). Also my GH4 and GH5 really aren't great on previewing the DR of the image and the result often differs from the preview. Oh and the lag is often more than the manufacturer likes to imply, especially in low light. Against that I like focus peaking, blinkies, in-VF image review. Basically both have clear pros and cons. I'm pretty sure both will be widely available in 5 years time. Currently my Canon DSLR has a transparent LCD over the viewfinder, a bit of development and that could greatly catch up with EVF advantages (they do have a relevant patent). In 2017, the market shrank by 10% to 13.5 million units, while our sales were flat at 4.04 million. In 2018, we expect the market to shrink by 19% to 11 million units. Within this, we expect our sale to decline 16% to 3.4 million. " Canon's 2018 projection for total ILC sale is also 11 million units, same as compact. It is interesting that people bought more compact than ILC for so many years despite smartphone onslaught. Vese: all that is also in live view on dslrs. But mirrorless doesn't have OVF which uses much less battery and shows exactly what's there unlike an electronic display which has color/DR limitations. I've been using an EVF for half a year now and I miss the OVF of my DSLR. We all have different preferences. WYSIWYG EVF comes at a very high cost. It requires the MILC to be stopped down to the exposure aperture while composing and autofocusing. Shooting indoors this can make it very difficult for the AF system to find focus. For this reason I have the WSYIWYG EVF turn off so the lens focuses wide open and just stops down for exposure. To me the EVF's key advantage is point 2, its usable in video. Otherwise give me an OVF. I've never used a view camera, but I own a Rollei TLR with a nice, bright ground glass screen and a few different viewing options. My first SLR was a Miranda with a VF that could be removed for waist level viewing. I've used SLRs with split screen focus aids, SLRs with 100% viewfinders, pentaprism VFs, pentamirror VFs, crappy LCD screens, better LCD screens, crappy EVFs (Sony F717 anyone ?) and pretty good EVFs, and there's nothing magical about the experience of looking through any viewfinder. I don't choose to "look at the world" through any of them - I look at it with my eyes. (Unfortunately, I do need to look at it through lenses, but that's another story). I use a viewfinder to compose a photo, not to look at the world, and for the seconds it takes to do that, I can tolerate looking at an electronic image as easily as looking through a little glass window. I know that as soon as I'm done taking the picture, the real world will still be there, ready to look at. EVF is still a little TV and not the real view. This is why the original poster is absolutely right. Seeing the real thing is a different experience from staring at little TVs screens. Which of those you like more does not change the fact that the experience is different. Except that you imply that the one is superior to the other "seeing the real thing" versus "staring at little TV screens". You could just as easily have said "seeing the subjects through the lens versus a WYSIWIG representation of the final image" but that wouldn't have been quite so condemning. (Why do you "see" one but "stare at" the other ?) There's something implicit in your "EVF is still a little TV" that being a "little TV" makes is somehow inferior, neglecting that the ultimate goal of taking a picture is to produce a flat, two dimensional representation of what you're seeing. I have to wonder, if seeing the real thing is so precious that you can't bear to look at an EVF for a few seconds ... what's the point of taking the picture ? The ultimate output is going to be something you probably can't bear to look at, either, because it also is far from the real view. I agree that the experience is different and everyone is free to like either (I like both). Those that dislike EVF's claiming it's like looking at the world through a TV are misguided. The EVF is not for looking at the world. Your two eye's are for that. The EVF is for looking at the image you are getting on your sensor. Surely that is fundamental for photography. The old view cameras did just that. EVF-s have good dynamic range. Also you have histogram inside them. Yes it is JPEG histrogram but helps and when you used to it becomes good tool. After all we use EVF-s to nail the exposure, composition and focus. Also EVF gives you proper bokeh. In OVF you can not see the bokeh right. Yes may be the dynamic ragne is not as RAW files but in DLSR you have nothing soo.... Also if you turn on your DRO dynamic range and histogram changes accordingly so you can use this trick too. In time EVF will improve. OVF have no room for imporvement. OVF show you the "real world" but do not show what you will record witch is more important. Nowadays we make and preview images on monitors. If you want to print them ....i dont see a problem. Everybody know photographers who take 1 shot and wait to check them on the backscreen every time. Check for focus, check for proper exposure, check for bokeh appearance. With EVF no anymore. The Epson LCDs that are popular in EVFs have a DR of about 8 stops, which isn't good as such. OLED EVFs are much better, but colour accuracy isn't great. you don't need color accuracy in the viewfinder. For what i care the end result as well as the shooting experience is just as good if the EVF display is B&W. How is this figure surprising? 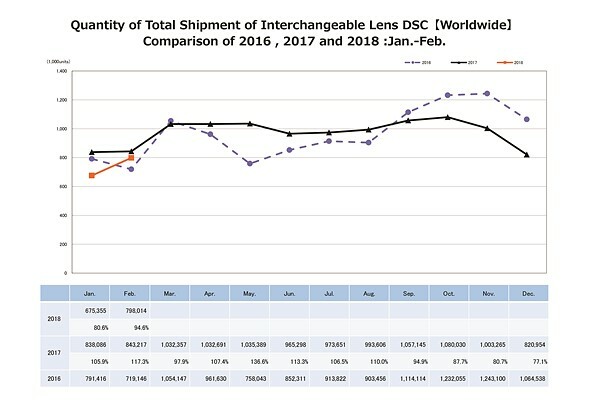 "To get to that overall 26.6% drop, you have to account for the whopping 44.7% drop in compact camera shipments... a sad if not surprising figure"
Camera manufactures hardly make ANY compact cameras in comparison any more. Hard to sell them if they aren't on the market! I agree, but which came first, drop in sales or drop in production? Oh no doubt sales declined first, I'm just pointing out that it shouldn't be much of a surprise at all. Perhaps if camera companies were a bit more creative or inventive with design, they could have intrigued the market a bit more and saved a bit of the market? I wonder sometimes. They still shipped over 13M compacts last year bringing in over $1.5B, so a market they will still want a piece of. You can't ignore a market that big - mirrorless was smaller at $1.3B. With the amount of Mirrorless fanboys on DPR you would think it’ll do better. @ ttran88: Is is like this for you? A fanboy = one that do not buy what you buy/use. Fanboys are basically cheerleaders of the consumer goods world. They probably wear skirts and tube tops behind their computers when they are cheering their brands on. No sir, I am completely naked behind the PC and boy, am I fan. 🤣 now may I ask, is that outfit for new product launches or standard dress code? Put it this way, just be very glad it doesn't involve any mirrors. Awwww, the visions. The worst thing is, it's a 63 year old man .......... run. Looking through a FF slr viewfinder beats other systems by a mile for me,but mirrorless systems are great.Just excellent choices we have today.Each to their own. Oh no, someone being reasonable, I had to put the Popcorn down. Spoil-sport! @Dr Jon. Will try to hate all this mirrorless stuff.Hate to be ruining anybody’s munchies. BTW really was eating popcorn. Double up on the butter,it’s the only way to go. Not happy !! I'll have to sell all my mirrorless gear now and buy a DSLR. Damn it. This is expected since Fuji X-H1 and Sony A7 III were ready to ship in March. I expect that there will be a sales boost in March or April. Summer is coming here in the upper half of the world. Might see a few more cameras sold for the vacationers perhaps. Just like a sales-boost when any other camera is newly available. Both the A7 III and X-H1 are to expensive to sell at high volumes for a longer period of time like a camera < €1000. For many people, CIPA numbers lie. SHIPPED is not the same as SOLD. Easy to rig the results by shipping cameras to warehouses where you expect them to sit unsold. Which is why you need to use annual numbers where such stuff gets averaged out. Also stuff like special offers and whether you ship the bulk of the cameras you want to sell at Christmas in Oct or Nov make a difference. Plus they are not a lie, they are what they say they are. So sellers of high-priced mirrorless cameras are ripping you off? Okay. Mirrorless = low cost to produce ? @Karroly - "No mirror for sure, but still a mechanical shutter"
i seldom use the mechanical shutter on my a9, because the electronic shutter photos are so good. and that's where the future of mirrorless is headed, while dslrs are stuck with primitive flapping mirrors and mechanical shutters... on my last shoot, i used 67% of the battery to shoot 2500 photos. so your understanding of mirrorless is way behind the times. and btw, your personal preferences wrt video are not relevant to what the overall market wants. "so your understanding of mirrorless is way behind the times"
"and btw, your personal preferences wrt video are not relevant to what the overall market wants"
There were no high end DSLR except 850 introduced. Most top end DSLR consumers already upgraded their cameras by 2017. As a result, an average sale price dropped a lot. Mirrorless were quite the opposite. SONY FF cameras and probably Fuji GFX helped to boost the average sale price a lot. @Karroly - the profit is with mirrorless, and so is the technology, and no it's not quite there yet with the little sensor olympus cameras, LMAO, even tho they are trying hard. the profit is with mirrorless, as the cipa numbers show, not your dslrs, and it's with high-end mirrorless. companies don't want entry-level dslrs, that market is getting overrun with smartphones, which is why dslr sales have been plunging for years now. as vlad mentioned, one d850 release for the entire high-end dslr market in 2017 also shows how weak the dslr market is. It's never been about design, components and cost to produce. It's about what people will buy and how much they are prepared to pay for it. It's called marketing. @Karroly A fundamental issue: Nobody buying the beggar-grade cameras are going to buy extra lenses. They stick with the kit and maybe a 50/1.8, that's it, 90% of the time. This is not an "issue". Some people buy an ILC because they know they can swap lenses if needed even if they finally do not do it. They are just happy to buy an "open" system, they do not feel themselves limited. This is like people who buy a computer with slots and never add any interface card into it. Oh my, the Open Talk people are going to have egg on their faces! I guess thats why Canon still pumping out Rebels. Oh no, this just won't do, just won't do at all. I can expect a tweet very shortly exclaiming fake news. My solution is simple, own 1 of each. If you can't take a decent photograph with any current camera (regardless of type), you really don't deserve to call yourself a photographer. True, but how is that relevant to this article about camera sales? Just anticipating a bunch of gear wonks arguing about the superiority of one system over another. well... to be honest one system can be superior over another, and clearly so, even if you take good or bad pictures with both. So your point is (while correct) irrelevant. It's not about "a decent photograph" but about the number of decent photographs. With worse gear there's just many more missed opportunities. S Yu - Yes that's a good point. A faster camera with better AF will give you a higher hit rate with sports, action, wildlife and some other genres. Probably not applicable to portaits, landscapes, product, still life and other static subjects though. DSLRs will continue to dominate until mirrorless can get the price down. People here may not have issues dropping a grand on a camera body but most regular people start to balk after 3 or 4 hundred bucks. so you are complaining that an a9, or a7rIII, a7III, X-H1, etc... are too expensive? you are looking at the wrong market, then 7DII, 5dIV, D850, D5, 1Dx are too expensive too. There is plenty cheap mirrorless cameras that have better specs then low of low DLSR "rebel" market. I agree. DSLR is dominating the lower market right now. Sony on the other hand focuses on higher-priced products. "There is plenty cheap mirrorless cameras that have better specs then low of low DLSR "rebel" market." Which MILC is as cheap as, let's say, a Canon EOS 4000D, while being superior at shooting stills (I do not care about video specs) AND offering a wide range of cheap native lenses AND a greater battery life ? Sony calls its $2000 A7III "entry level". it is, nothing in $2000 and full frame can match it. and it will sell like hot cakes. $2000 is entry level when you are looking at FF interchangeable lens cameras. Well I might buy a new camera in, say, 4 to 6 months or so. Or I might want to wait and see what the new Nikon mirrorless platform will offer. Sorta what I was thinking. I've also been thinking that Canon and Nikon have been taking their time for a reason, and whatever they release will likely be pretty good. Indeed. Discounting the conservative big two is a problem. They are biding their time - I hope - to do things right. Nail ergonomics, trim down hardware interfaces, make reliable buttons for gloves and naked hands, and ensure their systems are as free of hiccoughs and missteps as possible. Canon and Nikon are Not going to come out with cameras that blow their DSLR cameras out to of the water to start with. Even for them that would be risky. They will be good, but not great. No one is going to build a killer camera on the first try. We are talking Canon here, they will gimp it someway..
All they have to do is better than the competition, which, let's be honest, won't be hard. The only mainstream ones that for the last few years who design with basic holdability and hardware UI reliable for both naked hands and gloves are Panasonic. Fuji fail, Sony fail. Where Sony destroy the competition is AF. Fuji push great colour science and whatever appeal their hardware interface has. Nikon and Canon know how to make reliable hardware interfaces for both hot and cold weather. Nikon's Series 1 AF was amazing and surely what they bring out will be as good or better. All they have to do is implement those two knowledge bases to brute force their way into a market dominated by cameras built for one of the following: speed, looks, or ergonomics by blending each. Panasonic need to go full frame, period. Apply their outstanding ergonomics, versatility, natural colour (why I like them) and reliability to the inevitable future that Sony have proven valid with their FF sensors, but not their usability. The young people I know getting into videography in particular only mention Sony A series. (GH5s may be superb, but it requires extras to harness it's goodness, such as a stabiliser.) Put an FF sensor in the GH6, have it shoot 8K video and release a versatile compact zoom (hard I know due to the laws of physics), and they can hit Canikon where it hurts. Hurry up! Panasonic don't sell huge number of cameras (Oly sell 495k and Panny are a couple of places behind them) so developing a whole new lens range would never pay off. Can't see it. There are still around twice as many DSLR as mirrorless cameras sold, and there's a good reason for that: Most people prefer DSLR cameras. They offer good ergonomics, the old mirror mechanism is very reliable as is the camera as a whole. The fact that the nerds here at dpr mean otherwise won't change this, and the implications for the industry are huge. A small mirrorless market shared between several manufacturers (Sony, Olympus, Panasonic, Fuji, Canon etc.) is bound to be less profitable than a twice as big market mostly shared between Canon and Nikon. It's also a myth that it's much cheaper to produce a mirrorless camera than a DSLR. The mirror mechanism in DSLR cameras is very mature technology, and the production not complicated. The shutter and mirror of 50 year old SLR cameras mostly work fine still. The rest of the camera is mostly the same, except that it's much simpler to find space for all the electronics in a larger body, not to speak about cooling and weather sealing. > The shutter and mirror of 50 year old SLR cameras mostly work fine still. Some yes - some not so much. More crucially, none of those are 5fps or faster, none are 1/8000 shortest exposure time, none of them are designed to 100 or 200 thousand actuations. In malaysia, sony mirrorless is taking over. Canon blew it with the 6d ii. And people do like adapting lenses. That's my observations. I don't know who "people" are, but most of those I see with a DSLR or mirrorless camera use a kit zoom plus one or two additional lenses. Most cameras are bought by people who don't even know what an "adapted lens" is. Canon didn't blow it with the 6D II. It's only a terrible camera for nerds on forums like this. For most people, it's an excellent camera and more than they'll ever need. Most people don't use 5fps or 1/8000s, and they certainly don't take 100-200,000 images, and even if they do, today's DSLR bodies survive that. That's more than I can say about some of the mirrorless bodies I have owned, some of which have had bits and pieces falling off after 2-4 years, sometimes earlier. Battery life? Don't even mention it. It's a never ending nightmare when travelling, and I say that as a 100% mirrorless user (for the time being). 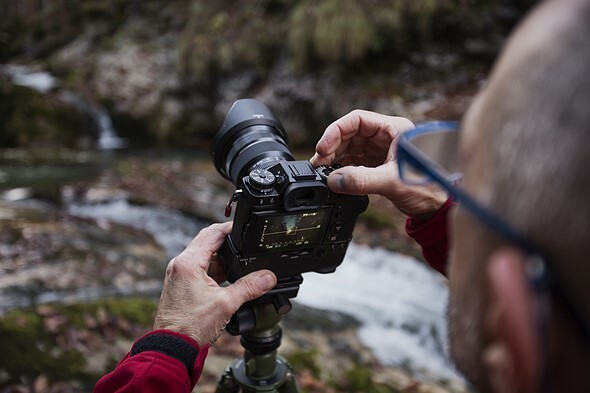 There's a lot of good things to be said about mirrorless cameras, but for most of the average users, they are not important enough to make the switch. My friend who works as a manager for a big camera store tells me that low end DLSRs like the Rebels have always been a consistent seller among many common folks and beginners. I guess the perception that the DSLR is the better camera is still alive and well among the masses. Newsflash to Mared, the average consumer has no idea what twin memory card slots, full sensor read-out, headphone out, video codec, and dynamic range are. My last SLR was EOS 630, introduced in 1989. I was using it until 2004, when I switched to digital. Since then I haven't had any single DSLR. Newsflash to Paul Jones, the average consumer has no idea what "full-frame" is or why in the heck they would spend over a $1,000 on a dedicated camera. This stuff is bought almost exclusively by enthusiasts and pros, and they (us) DO care about specs. Thanks Kharan. It's obvious Paul B Jones that you're a Canon apologist and the 6D II is a $2,000.00 (well originally) then $1,900.00 and now $1,699.00 outdated and underspecified camera (Newsflash). PS That's a lot of discounting in the first year of a product. I wonder if we'll see that in the D850? 1 inch camera like RX100 series is dying? You are equating specs to market preference. In marketing and product development it is the other way around. History is filled with the fossils of long-dead, tech-savvy companies that let that tech drive them to extinction. now the phone camera equipped with multi-frame image stabilizer, multiple bright lens with new noise reduction. that is enough for immediate social media sharing. No real indication 1" cameras are dying. They were always a very small volume / high value part of the overall point & shoot market. It's the sales of any 1/2.3" camera that doesn't have a unique selling proposition (i.e. ultra long zoom range OR rugged & waterproof) that have just completely, totally fallen off a cliff. Jeff.... that category of compact cameras with 1 inch sensors is probably the ONLY compact cameras selling well right now. ... and 4 of those 11 fixed lens cameras had large sensors. The compact camera market has completely evaporated, with the only exceptions being a tiny number of rugged cameras and superzooms. But it really isn't as bad as some are suggesting. Rather than selling a whole bunch of cheap 3X zoom compacts with small sensors, they are now selling a much smaller number of very expensive large sensor compacts. In other words, revenue is down, but not nearly as much as the volume decline would suggest because of much higher prices. Is the best Hauwei P9 for now? Jeff.... Nikon actually tried selling a 1" rugged camera, the AW1. Unfortunately, being an ILC it wasn't really waterproof, so it failed. The AW1 did appeal to hikers and other outdoor types, but was pretty much useless for scuba diving. I really believe a fixed lens rugged compact with a 1 inch sensor would be a huge hit. Since it could be used in any harsh conditions. Above, or below the water. I wonder if they include action cameras like gopro in the numbers. GoPro (specifically) isn't a Japanese company, so it wouldn't be included. Hipsters are going to go wild once nobody used P&S cameras. I expect the used market to flourish. People stopped buying mirrorless in Feb, basically waiting for the A7iii and M50 to be made available. Let compacts die off like the ipod did. No coming back in numbers for that type of camera. When compared to February 2017, DSLR companies produced 4% more pieces. But the worldwide DSLR shipments in February 2018 went up only by 0.1%. Revenue went down 6.4%. At the same time, mirrorless camera manufacturers produced 11.3% fewer cameras, worldwide mirrorless shipments went down 15.8% but revenue went up 14.1%. DSLRs: produced more, sold the same amount of pieces but brought back less money. Mirrorless: produced less, sold fewer pieces but brought in significantly more money (if we consider that 14% is significant for business). Just looking at these numbers and not knowing exactly what types of cameras were being sold (i.e. APSC, full-frame, low-end, high-end, etc), I'd say that mirrorless cameras way outperformed DSLRs. Yep. From a marketing perspective, mirrorless OEMs are following Apple's strategy, while Canon and Nikon are looking like PC OEMs racing to the bottom. I won't compare the production and shipment data and interpret it this way. There is a big misalignment between them at a monthly basis. Go and read the cipa data analysis in the rumor forum from user rrcad. I think he has the best understanding of the cipa data. You want mirrorless sale rising up about 26,6 %? Bring FF Contax G3 digital or Bessa R4A digital with great EVF ! pr can say sales up by 100%! Do you ever wonder why no one responds to your posts like this? You should be careful about your prejudication about people not understanding your messed up postings. Yes, it can be understood. But to understand you post, people have to presuppose too much points that you might want to say. Yes, its easy to point out that if you don't understand me, you're dump. Its never a bad student, its always a bad teacher (you want to teach us something, i suppose?). So get your "pure logic" in line and write it in a way to be understood by your audience, its a public forum for anyone after all. This is what the enlightened one would have done at least. the wise need never seek to "teach"
Mirrorless ILC are simply too expensive for what they offer. You find a better DSLR from the two top brands in each price range. Only because the technology is immature and the primary players have little enough competition to allow greed. MILC's are theoretically dirt-cheap to produce, and if the market were ever flooded with them, they /ought/ to cost less than a DSLR. Miniaturization is a massive cost to any tech component. For it to be cheaper, you need more people buying or it needs to get bigger. Agreed, @trungtran, but excessive miniaturization is not always necessary for the various MILC formats; the physical flange distance being shorter is all that some folks really expect. Miniaturization aside, I think you guys are all going a bit too easy on the OP by accepting his premise that there is a better DSLR at every single price point. I don't think there's any solid evidence that's true, especially not if you're looking at a broad range of capabilities. Certainly DPReview doesn't believe your statement is true. You can bet the A7 III will be a strong contender to replace the D750, when it is reviewed, too. How can a $1,000 camera be too expensive when a cup of coffee costs $5, and a new car costs around $35,000? If you account for inflation, a Canon Digital Rebel is now around half the price it was back in 2003. I know people who want a good family camera that overcomes limitations of their smartphone but are not able/allowed to spend more than €400 for a kit. Canon Rebel or Nikon D3xxx are their best choices for the time being. Dpreview's pick of a M100 costs more, lacks a viewfinder and faces limitations in AF/low light performance -- exactly the weaknesses of a smartphone. As long as my favorite brand X sales enough body's and lenses to stay in business I don't care about sales. Mirrorless is a fad, Nikon and Canon would be wise to just skip it. LOL. ttran88, *Yesterday* was April Fool's. FF is a bit too much for me, I'm fine with C or D.
I was looking into buying a P&S - not an expensive one, just something to keep in the pocket when not using DSLR or bridge camera. Other than the 'expert compacts' most of them start at f3 or narrower, poor low light performance (CCDs in the mix too) whereas phones are now going for F2 or wider. No chance of takng photos in anything but good light or using flash - why don't the compact manufacturers wake up? How difficult can it be to develop a cam with small (BSI?) sensor, wide aperture and forget the my zoom's bigger than yours gimmick? I'm guessing the cost of making an actual cheap but decent spec camera is not worth their time because of the costs and limited demand. If you want quality in a compact you have no choice but to pay the premium. Get Canon G9X mk II, It's the smallest 1" sensor compact on the market. It's f/2 at wide end. G9X will beat any phone anytime. DSLR sales on the up? Get out of here! Nah, probably happened in the lower end. Note that mirrorless revenues are same as DSLR revenues. So basically lots of cheap SLRs and few expensive mirrorless cameras. I guess few A7r3, A9 cameras vs. many cheaper SLR models. ...but it does explain why Canon and Nikon are planning to move forward on full frame MILC. CIPA(&co) and journalists, including dpreview, should really focus on revenue figures instead of units when making analysis. @oliver Gallen. Why? Markets are of course analysed in a number of ways, however ‘units’ (whether registered sold or shipped) is often the key measure. Why this measure? Because it is derived from objective market data without additional information from the players in the market. Facts are friends! Because selling 10.000 cameras at $5.000 makes you a player on the market whereas selling 10.000 cameras at $500 makes you a nobody. Revenues are objective (as units are) and there is a reason why investors look first at revenues (and results). Would you really dare to say "A at $1M revenue and 2.000 units outperformed B at $5M and 1.000 units"? I would not. PS: I work in a company selling cameras. Nobody really look at 'units' (even if mentioned). Revenue: yes. Margin: Oh yeah!!! For me as consumer neither revenue or total units sold tell the full story. Dpreview to me misreported this. The correct way to phrase it is that mirrorless are selling fewer more expensive units. The DSLR makers on the other hand are able to push more units albeit at lower cost. I know this kind of removes the sensationalism that a journalist is after. That is the fact on the ground. Sony have abandoned completely the aps-c entry class, Fuji do the same to large degree. We see both companies plus Olympus and Panasonic building ever more expensive models and putting their efforts ain’t this higher value market. @Kandid: I agree with you (even if international accounting standards make things clearer for stock-listed companies). In short, you're getting a much more capable camera that's much more enjoyable to use than any phone, and at a fraction of the size and weight of an interchangeable lens camera with similar zoom range. The only real catch? It's $800. ...and those "really good" camera phones cost around $1,000. The only real catch is that it's painful to share the photos easily — that's why compact cameras are dead. @yslee1 - sharing is also easy now, with the advent of WiFi + Bluetooth Low Energy constant connection. This is something that the TZ200 I mentioned above offers that was missing in its predecessor. Gradually all high-end compact cameras will support this feature, and sharing difficulties will be a thing of the past. 2. Comparing a camera with a 35mm-equiv lens to one with a 24-360mm-equiv one is completely pointless. You might as well compare it with an 8x10" large format scanning back. It's just as relevant. If you can't share in 5 seconds, consumers aren't going to care; that's really what the general populace care about. Compacts are tanking for a reason. With WiFi + Bluetooth Low Energy constant connection you can share in less than 5 seconds. Most compact cameras don't have this technology yet, so the 5 seconds is more like 30 seconds. Bottom end Canon and Nikon DSLRs have a much greater retail presence than mirrorless bodies, at least in North America. The only mirrorless bodies you might see in a big box store are Sony's A5100 and A6000, both of which are quite old, with a lousy 16-50 kit lens. Given the lack of choice, it's not hard to see why the big two manage to maintain high levels of entry level DSLR sales. Hasn't DSLR/mirrorless become a meaningless distinction since the advent of electronic viewfinders/screens that show you what the sensor sees? What possible reason remains for separating them? Every DSLR in live view mode is functioning as a "mirrorless" camera. yes, right up till the moment you start taking photos through the viewfinder. Olifaunt, a valid question, but for DPR's sake I hope not: They probably get 50% of their clicks from mirrorless/DSLR fanboys defending their technology and attacking the other side. Ash mills... and mirrorless people don't take photos through the viewfinder? It hasn't been meaningless since the advent of the EVF since the first EVFs were utterly horrible. Of course, CIPA should know better photo enthusiasts and professionals do not buy cameras everytime dSLR companies crank out new models like Canon ! Duh! Like I do not buy every cellphones that comes out every year. I pulled my Canon G7x MarkII from eBay guess have to wait a little longer. It looks like it is going to be collectible soon with the demise of P&S. I think that eBay might be the problem. I see a lot fewer listings and few sellers than a year or two ago. For hard to find camera accessories, it used to be that eBay had more of a selection than Amazon. Now that situation is completely reversed. I think that segment of P&S is the only one still selling well. Everybody knows DSLRs are the only proper cameras. Some MILCs come close but it's like butter and margarine. If you want to taste butter you better buy butter. My 8x10 monorail is definitely a real camera. Now, what happened to that E6 lab around the corner again? noyo - ALL cameras are proper cameras, they just need proper photographers to operate them. A poor photographer will take poor photos even with a professional DSLR or mirrorless. A good photographer can take good photos even with a 50 year old Kodak. I wasn't aware that 8x10 was a digital format. You learn something new every day. Ermahgerd, DSLR sales up 0.1%, while mirrorless sales dropped by 15.8%! Extinction-facing dinosaurs with no flapping mirrors are doomed! LOL. Conclusion: anyone who ends his/her post with "LOL" or similar, is a troll. Another clue, Sherlock, is posts that start with "Ermahgherd". Like last year, Asia continues to buy more mirrorless cameras than The Americas and Europe combined. Japan is broken out. The rest of Asia is lumped in with the rest of the world. @Sangster: Huh? CIPA camera shipment charts lists Asia as separate and distinct region. It's not "lumped in with the rest of the world". Are we looking at the same table? @Sangster: That explains it, we are looking at different tables. I am looking at the lower By Destination table that DPR didn't post. DSLRs? Aren't they just... Dead? Yeah, that "phrase" like "repent the world is ending" yet the world has not ended ... YET !!! DSLRs & ILCs are in ICUs Nikon maybe on its last gasp. In the world of miniaturization it will eventually die like those behemoth dinosaurs .... cell cams will make them extinct . Quite possibly so, but the operating term here is "eventually". Demand for F-mount and EF mount cameras will remain as long as there are compatible lenses on the market - new or used. I'd bet on cell phone cams going extinct before that happens - replaced by wearable AR tech. Give it a few decades and we'll see. What the heck is "AR tech"? Sorry - Augmented Reality technology. Stuff you see in scifi movies like computer glasses that overlay a virtual reality on the real world. I challenge you to find a SINGLE prediction on dpreview that DSLRs would be extinct by 2014. @mgrum. I have also been reading predictions here on the complete demise of DSLR since 2008. If you are a regular forum or comment reader, you would have read them too, even if you don't/won't remember them. Well you clearly didn't read it as "everyone predicted X, and look it hasn't happened" is a perfect example of a straw man argument if the initial assertion is untrue. According to Vik2012 "lots of people" made a prediction. I'm asking for a single example, which apparently cannot be provided.... laugh out loud, as you say. @mgrum, there are examples if you bother to look for them rather than sit there demanding people get them for you. @HayatoY - Good point, but how would mgrum indulge his obsession with straw men if he didn't throw in references wherever he felt like it? Look at the shipment numbers and compare unit and value. It is obvious that mirrorless is shifting to high-end (lower units but with higher value), and DSLR the opposite. Mirrorless makers are not "shifting". They're simply sacrificing the low-end range, which wasn't selling very well. And cheap DSLRs are selling brilliantly. Simple fact is: you can make a $400 DSLR sacrificing a bit of performance (IQ, fps) - not usability and "experience". Most D3400 buyers will never get a second lens, so they're really buying large compacts. They want what we used to love SLRs for: a viewfinder, a good grip, a "mechanical" feel and excellent battery life. This is not happening with mirrorless. Cheap MILC are just oversized smartphones with zoom. And a good EVF inflates the price. It's the same with IBIS vs OIS. Yes, with IBIS you pay once and it works with all (or most) lenses. But what if you're only going to buy 1-2 lenses? IBIS is very expensive and affects the whole body design. A decent OIS (3-4 stops) is very cheap and hardly contributes to the price of something like a Nikkor 18-55 or 55-200. What I see is mirrorless companies actively adjusted to recent market changes. "Cheap DSLRs are selling brilliantly" Really? DSLR sales dropped 50% in the last four years, and most of the drop is from lower-end. The way you described mirrorless vs DLSR is totally double standarded. Generally speaking, mirrorless cameras have lower cost than DLSRs. Lower-end mirrorless cameras do not need to have good EVF, good IQ, high fps, or IBIS. Most mirrorless kit lens are with OIS. Canon stated several times their new M6/M100 are selling well. I think those are the oversized smartphones you were talking about. I really doubt Cheap DSLR's are jumping off the shelves. Go to any Soccer game and most have a Cellphone out. Cheap cameras of any kind are DOA. All these newer cameras are up into the 2000 + dollar range now. They have given up on even the mid priced ones. As I said: mirrorless makers did, DSLR manufacturers didn't. Canon and Nikon are still pushing the ~$500-800 lineup. This is their real cash cow. DSLR sales dropped 50% worldwide, but most of this comes from the most wealthy countries. AFAIK Sony even beat Canon in sales in US at some point. Thing is though: majority of people in US, Japan and western Europe buy flagship phones with good cameras. This is not true for most of the world. Sony concentrated on rich markets. They make premium products, they sell it on a limited area. Pretty much what Apple does. C&N sell everywhere. They have a larger market share and must provide a wider range of products (this is what Samsung does in smartphones). I keep saying this: a D5300 might be a good "first body" in US, but worldwide it's very popular among enthusiasts and even professionals. C&N are also interested in these clients. Sony isn't.